Feeling blue because you won’t see your long-distance steady on Valentine’s Day? Don't let the hopelessness sink in just yet. 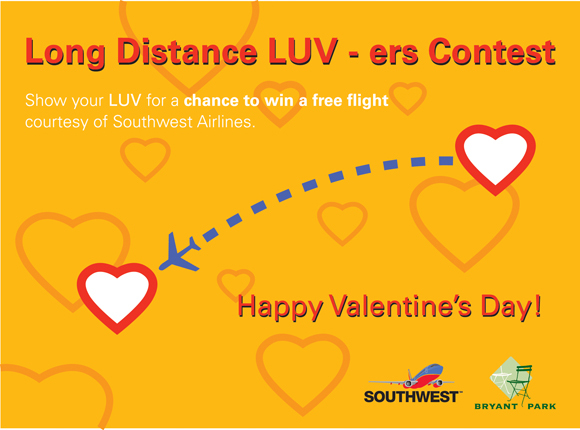 We're partnering with Southwest Airlines to reunite two very lucky couples in honor of Saint Valentine's Day. We're calling for long-distance couples of all kinds, be they platonic, familial, or friendly, to enter our Valentine's Day Contest. Eligible long-distance sweeties include your mom, best friend, brother, college roommate... you can enter with anyone you love and miss. Just remember, one of the partners in your long distance duo must live in the New York City area. When you visit your New York sweetheart, we'll also send you to the Southwest Porch at Bryant Park to kick back with a taste of ‘wichcraft's signature sips and snacks. Submit a photo of your geographically-challenged duo and tell us why you should be reunited with your long-distance loved one in New York City. Please limit explanations to 150 words or less. And remember, we LUV Southwest Airlines and Bryant Park related stories. While you submit your lovey-dovey tales, we'll ask our Facebook fans to vote on your entries. The two couples with the most votes will win one free ticket each for the non-NYC dwelling partner to visit their New York sweetie. Enter the contest and vote for your favorite story. Entries will be accepted and voting will be open through Monday, February 13 at 11:59pm EST. We will announce the winners on Tuesday, February 14.